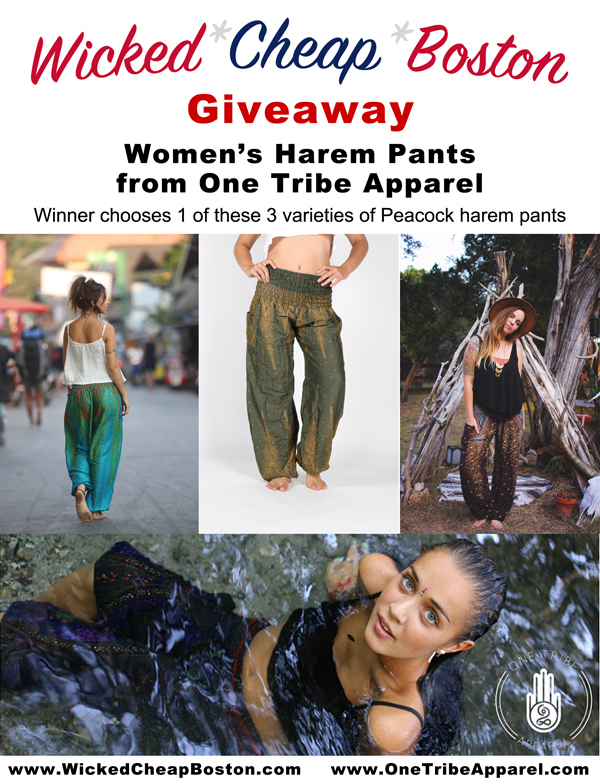 Wicked Cheap Boston has teamed up with One Tribe Apparel to offer you an opportunity to WIN a FREE pair of their Peacock harem pants, with 3 varieties to choose from. The giveaway starts now and you can enter via the Rafflecopter widget below up until 11:59 pm on December 29th. The winner will be chosen at random and announced on December 30th or 31st. They will then be able to choose between the blue sky, forest green, or brown & yellow peacock harem pants. Images of each are visible down towards the bottom of this post. Click here to jump down to the images. 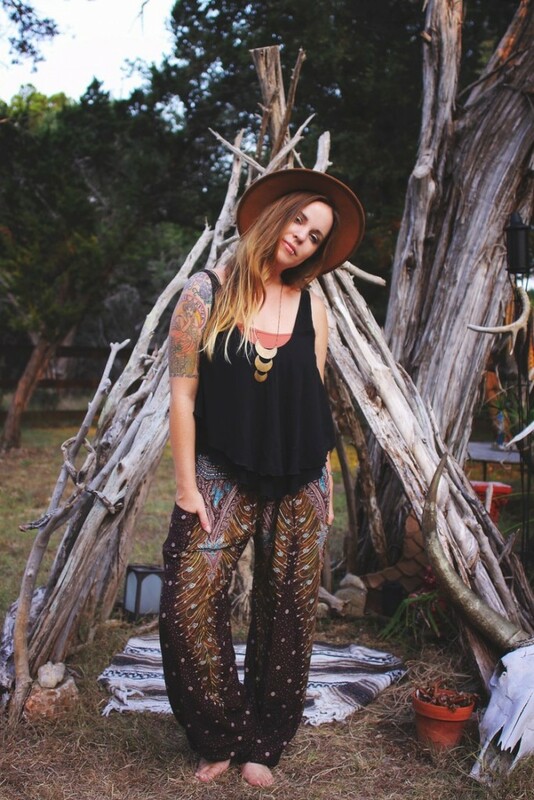 This is the perfect chance for all boho fashionistas and yoga lovers to get some awesome new harem pants for the new year. Start 2016 in style! In addition, they’ve been gracious enough to offer Wicked Cheap Boston’s readers an exclusive 15% discount on all their products through December 31st, 2015. So, even if you don’t win the giveaway you can still buy One Tribe Apparel’s harem pants online and use the discount code boston15 to save 15% on your purchase. You must login via your email address or Facebook account before you can see the entry options in the Rafflecopter widget below. There are many ways to enter, with each way giving you between 1 and 5 entries. The more entries you submit the better your odds of winning. You can also get more entries by sharing this giveaway with your friends so spread the word! 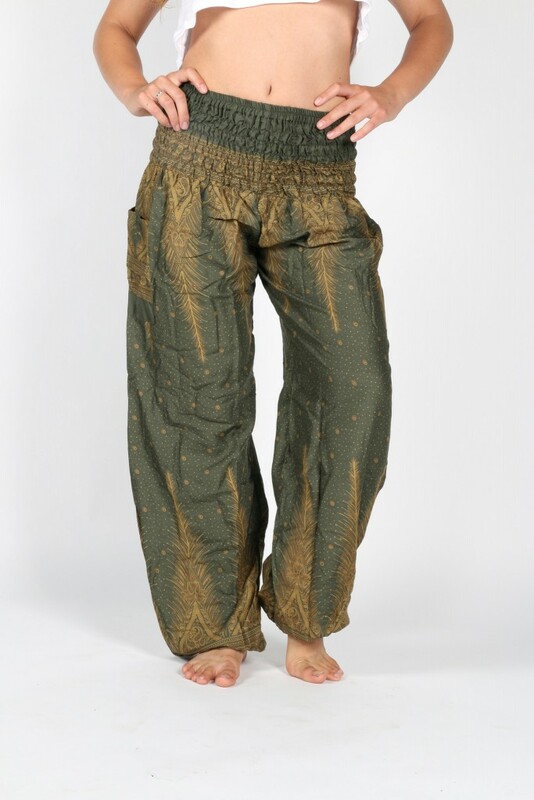 Hand made in Thailand, One Tribe Apparel harem pants for women provide the ultimate in comfort and come in five distinct styles, each with multiple colors to choose from. Perfect for festivals, yoga, traveling, or staying comfy at home, these women’s harem pants are guaranteed to be a frequent go-to in your wardrobe. Follow One Tribe Apparel on Instagram to see beautiful photography of their pants worn out in the world and to be informed of any new sales or giveaways. Made with the upmost care in the Mountain Villages of Northern Thailand, our peacock pants are produced using 100% bamboo rayon, local fabrics and traditional village techniques. Designed to embody the feathers of a peacock, the bold and beautiful peacock harem pants feature decorative patterns unique to each fashionista. Free flowing, comfortable and hand-stitched, these statement pieces can be dressed up or down to fit your exact needs. With breathability and lightweight material, these pants are fitted with practical side pockets, elastic waistband and ankles to ensure true comfort during both the day and night. They’re a staple item in any wardrobe and can be worn on or off the yoga mat. The winner of the giveaway will be allowed to select their favorite of these 3 options pictured below. Click here to view more details about these pants on their website. Click here to jump back up to the top of the post. Now that you’ve got some brand new comfortable and fashionable pants for yoga , go show them off at some yoga classes in Boston. Thank you One Tribe Apparel for working with us! And thank YOU reading this for visiting Wicked Cheap Boston. Aaron, I just want to personally thank you for the comment and for all the tweets you’ve been posting about the giveaway. You must really want to win the harem pants. Amanda is a lucky lady! I’m also glad to hear I received a visit from Philadelphia, my place of origin. Go Eagles! I love these Harem Pants! I would wear them in the summer to friday movie nights in Boston! I would wear them to the 4th July on the HatchShell and they would be great for a night out at Fanuel Hall! I would love to see you post more things in Boston free or cheap.. like the mayor’s holiday discounts for Christmas events, none on your page. Also free giveaways in Boston, different things especially in summer. Or the free movie night schedule in Boston all over the city- or the free plays on the common in the summer or the summer jams schedule. Would be great to have a place to find all this stuff in one place! Thank you so much for the comment and for entering the giveaway. I’m sorry you did not win, but we may do another giveaway with One Tribe Apparel in the Spring so check back then. Also, thanks for the suggestions on new content. I totally admit, I got caught up in my own family events and dropped the ball on Christmas and New Year’s Eve events and deals. I’m back to work now and have a list of about 30 different articles I plan to write over the next couple months so keep checking back for new content you might like and thank you in advance for sharing this site with your friends and followers. Happy holidays, happy new year, and thank you for visiting!